I’m so excited to finally share our kitchen remodel. 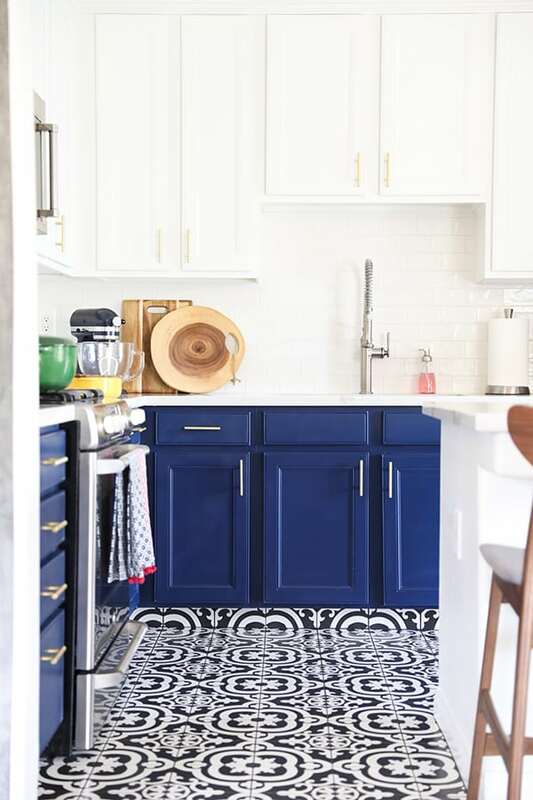 We updated our small dark kitchen with traditional finishes to a bright and modern kitchen with navy blue and white kitchen cabinets, black and white tile floor and gold kitchen cabinet hardware that is perfect for our family. We didn’t set out to remodel our kitchen. We came back from our vacation to find a leak had damaged the cabinets under the sink and there was moisture in the drywall. 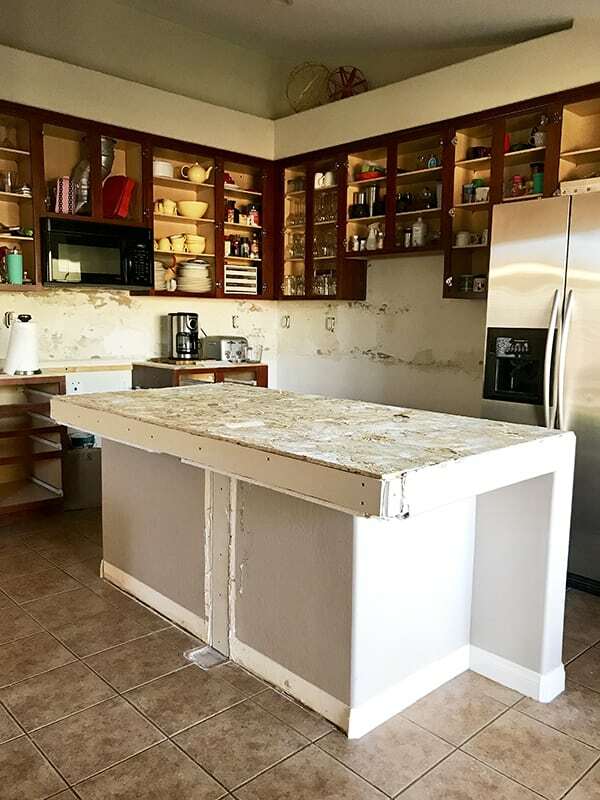 The cabinets had tile on top, so that had to be removed as well. We decided to replace the tile countertops with quartz, and instead of refinishing the cabinets we had them painted. Here is our kitchen shortly after they started demo. I’m grateful to our local restoration company ProRestoration Service , who repaired the water damage and acted as our contractor for the remodel. 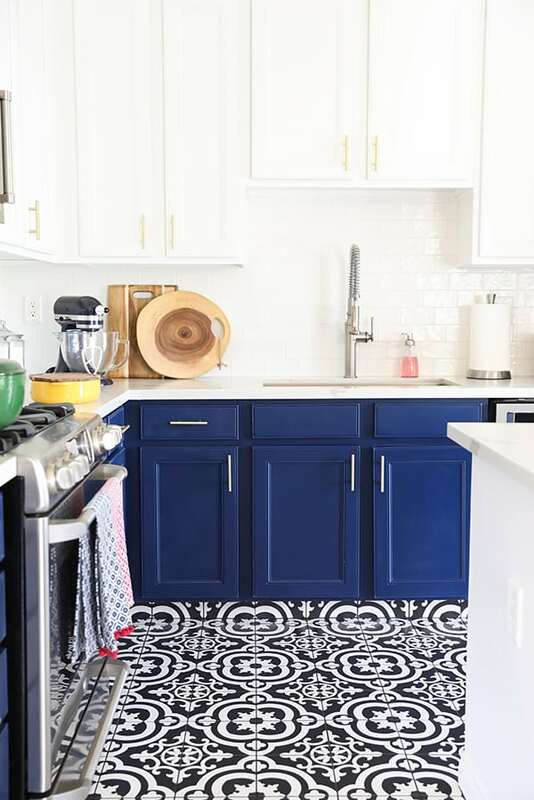 They finished painting the cabinets and installing the countertops in January and last month we had our friends at Haversack Tile complete the new tile floor. We also finally settled on a refrigerator which was the last piece of the new kitchen! Here is a picture of our old kitchen prior to the water damage. We had dark wood cabinets, dark granite island, brown tile on the floors and counters, and black appliances, except for our old side by side stainless steel refrigerator. 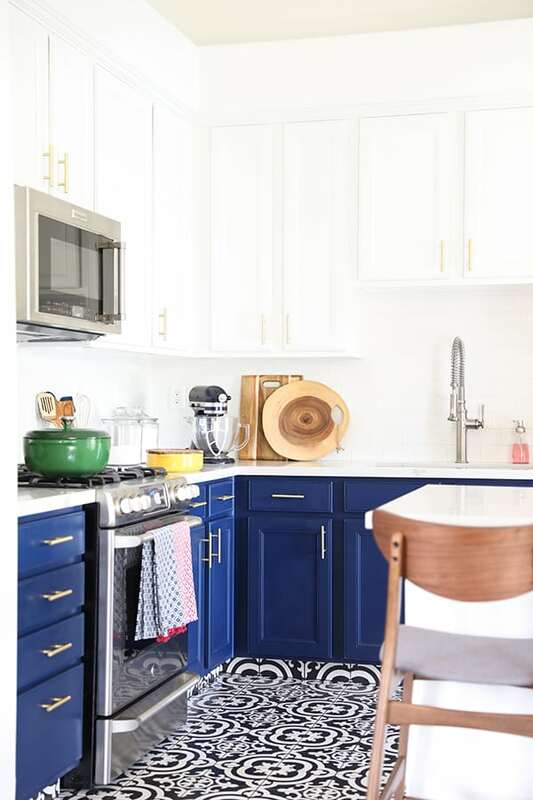 I’ve been saving and pinning pictures of navy blue kitchens for a long time. 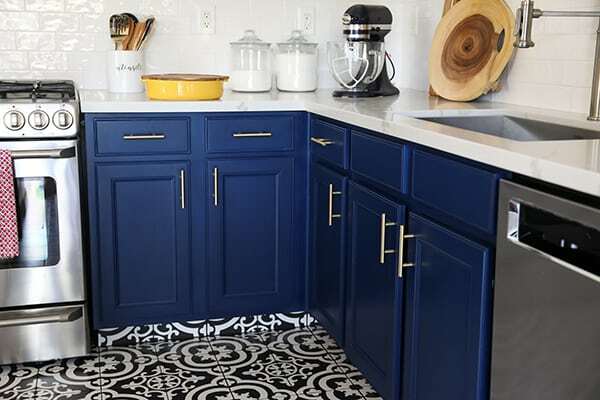 I love the contrast of the blue and white cabinets with the gold hardware. This was pretty much the jumping off point for the entire look of the kitchen. We used Salty Dog from Sherwin Williams for the blue kitchen cabinets and Pure White from Sherwin Williams for the white cabinets. I brought in touches of warmth with wood accents, gold kitchen cabinet hardware and colorful kitchen accessories. I’m so happy with the black and white tile. 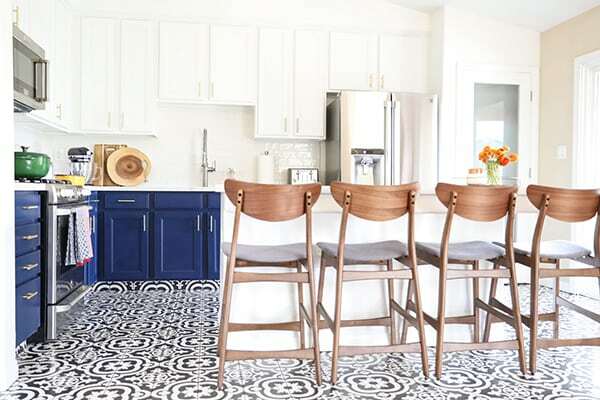 It looks like expensive cement tile, but it’s actually very affordable and easy to maintain ceramic tile. We used this Black and White Tile from Lowe’s. We ordered online and picked up at the store. We went with charcoal/black grout and I think it blends really nicely with the tile. One of my favorite parts of our new kitchen is the gold kitchen cabinet hardware. 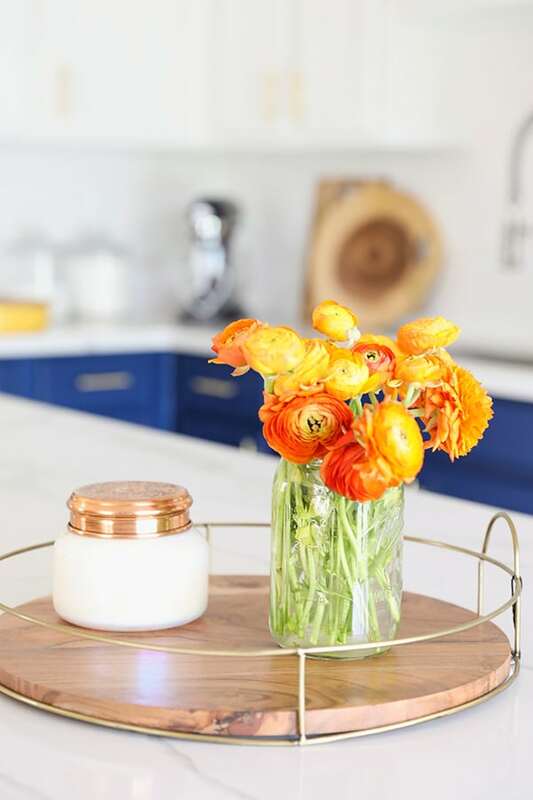 It is so affordable and easy to DIY! 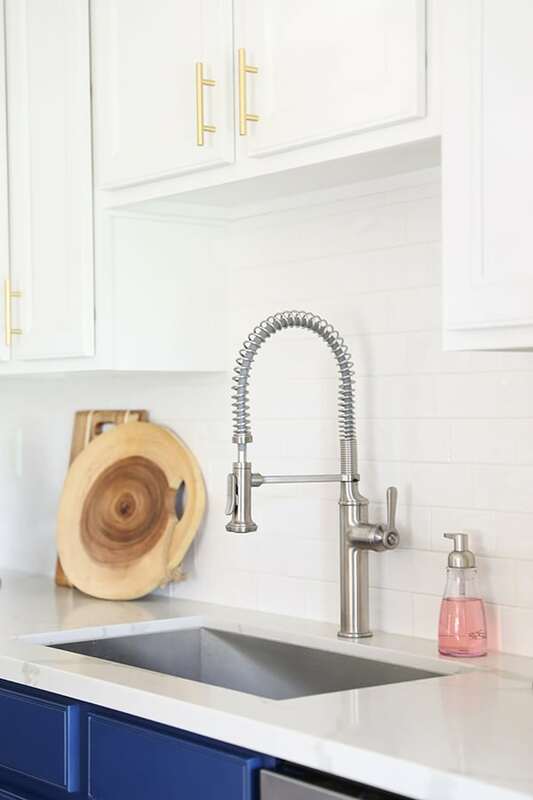 A quick and easy update for any kitchen. We used this hardware mounting guide and it made it so easy! One of the biggest changes we made was to cut down the island. We did this for two reasons, the first is that it actually made our small kitchen flow better. The rounded island was huge and protruded out into the traffic area that flows to the backyard. The second was that it actually saved us money. We were able to buy prefabricated pieces of quartz, two countertop pieces and a peninsula piece for the island. By cutting down the island we were able to avoid having to order a custom slab of quartz that would fit. I knew we wanted to use white subway tile for the backsplash, but when the contractor brought this sample, I really loved it. 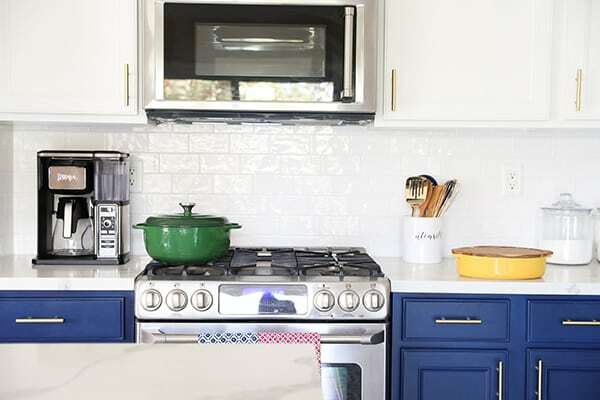 They are still classic white subway tile, but they have a handmade look. It’s harder to see in the pictures, but they have a pretty texture that almost makes them shimmer when the light hits them. It’s very pretty in person! 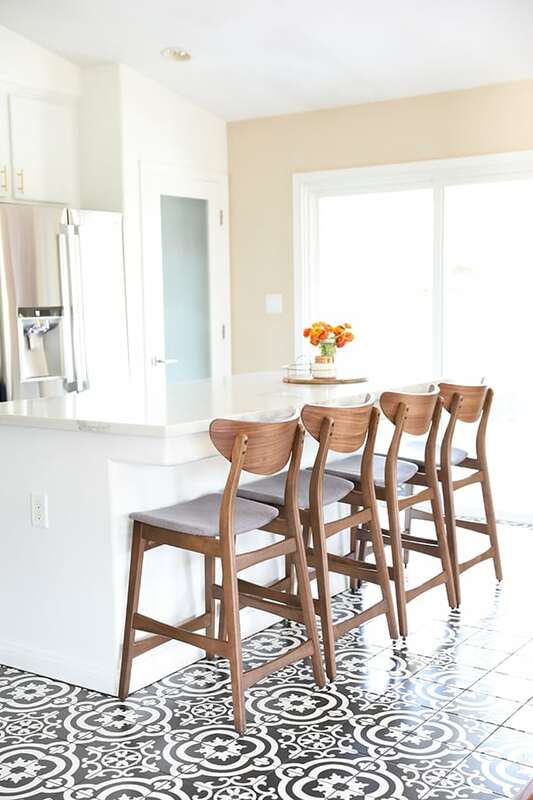 We love these Mid Century Counter Height Stools. Previously we had metal backless bar stools, and several times my two youngest lost their balance and fell off the smooth metal. They are loving the cushion and the comfy backs on these stools. I love the modern style and the affordable price! We used Scotchguard on the fabric to help prevent stains, but I also think they will be very easy to recover in a year or two. We were able to save money by choosing stainless steel finishes, shopping around and buying floor models or out of the box appliances. 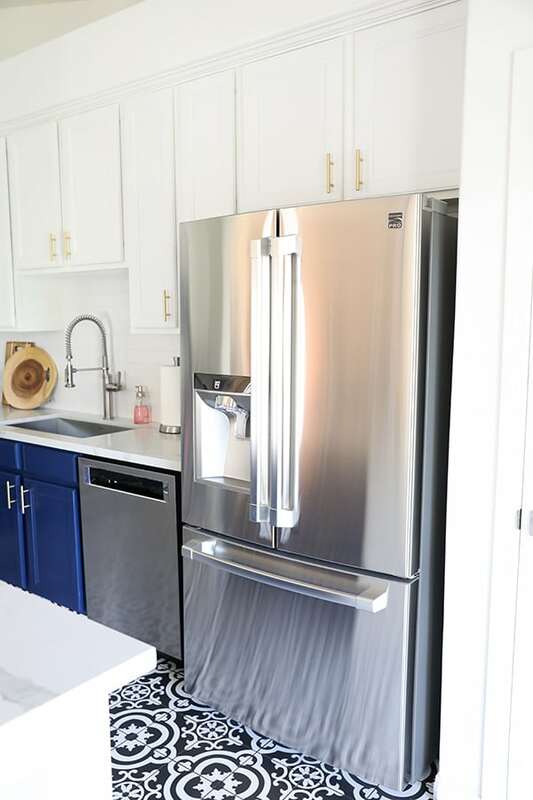 Black stainless steel appliances are the newest trending finish, but by sticking with stainless, we had more budget-friendly choices and inventory to choose from. Another big change we made was to switch out our cooktop and wall oven for a slide-in range. The builder had placed the built-in oven right under the cooktop, so we asked the contractor to cut through the cabinet framing so we could slide in a range. I love the look of the slide-in range and it was a huge budget saver! 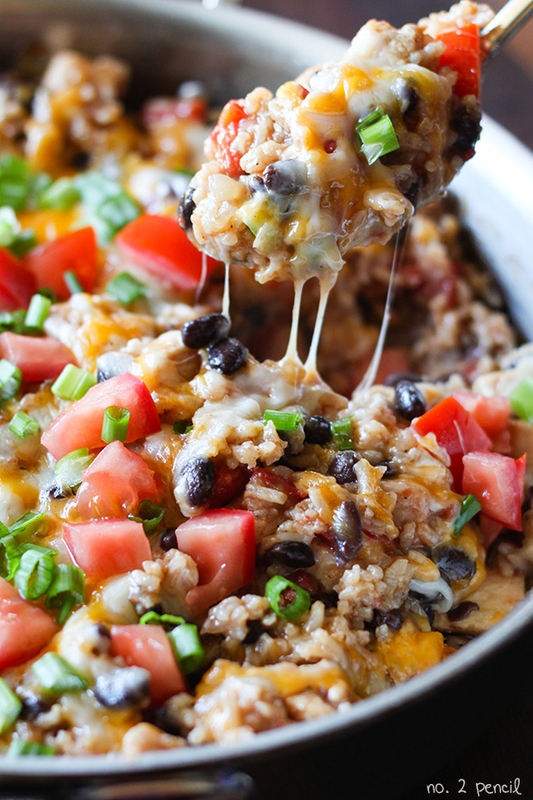 Cooktops and built-in ovens can be very expensive. We bought this floor model range for $800. The MSRP was over $3,000! I wanted appliances that were more functional than our old appliances. Our range has a baking drawer under the stove, and our microwave is also a convection oven. So even though we have a small kitchen, we have three functional ovens! This Kenmore Pro Refrigerator is absolutely my favorite new appliance. It’s bright and beautiful inside and the organization is perfect! I’m was super excited to see that you can buy this refrigerator on Amazon! It’s currently less than we paid at Sears Outlet, and shipping is free! With the new kitchen, I was ready for a fresh look for the pantry door. 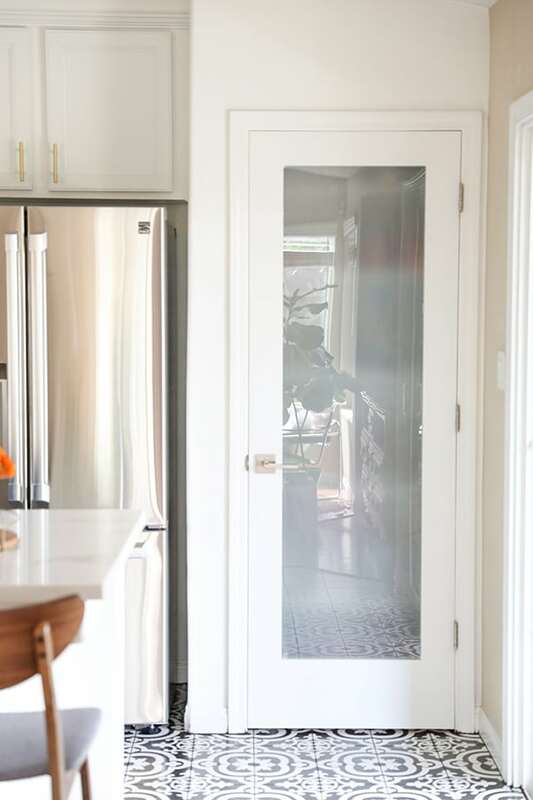 We switched out the door for a very affordable glass interior door. It has a light frost, so it helps hide the content but still lets in the light. 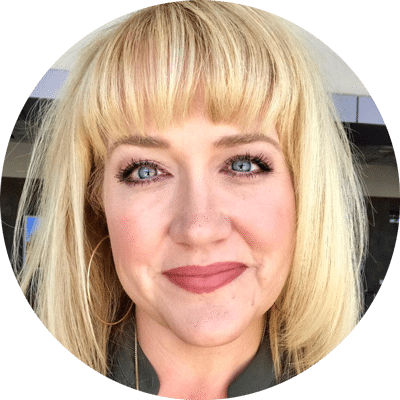 This is another small budget friendly change that makes a big impact. Melissa it’s GORGEOUS!!! I love every detail!! Melissa that turned out just beautiful. I now you will enjoy it for many years. I can’t believe it’s the same kitchen. I love it!!!! Melissaaaaa!!! This is like whoa. I love everything. Those floors are to die for. Gorgeous, gorgeous!! Kelly! You are the best! Thank you!!!!! I am in love with the color scheme. 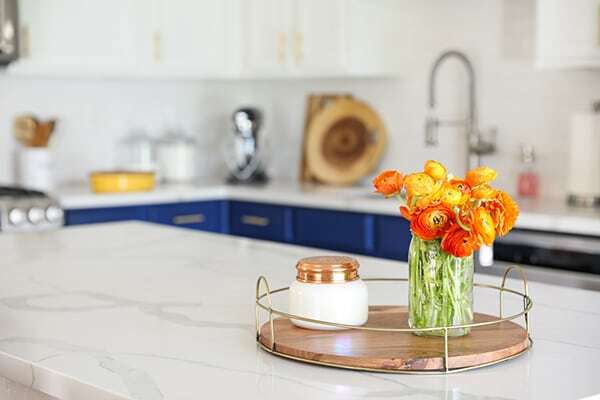 All the decoration items are perfect to place in a modern kitchen and the blue color is amazing and unique look. Thanks for sharing the idea. Thank you so much, Mani! The kitchen is the place where I spend most of my free time. So, I like to cook all kinds of meals. 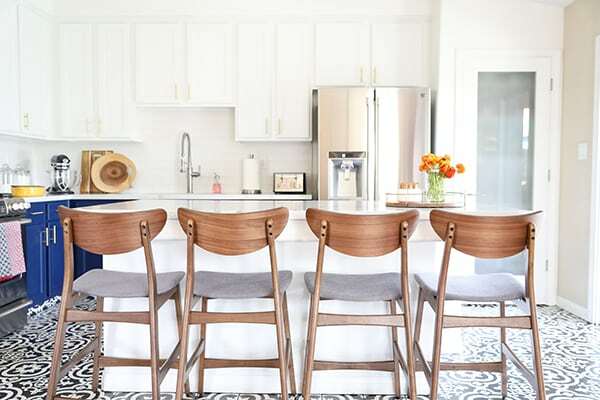 Also, kitchen design is very important to me, so reading blogs like this is a real joy. I think that blue kitchen is the best no doubts. What do you think about the red kitchen? Thank you, Alex! 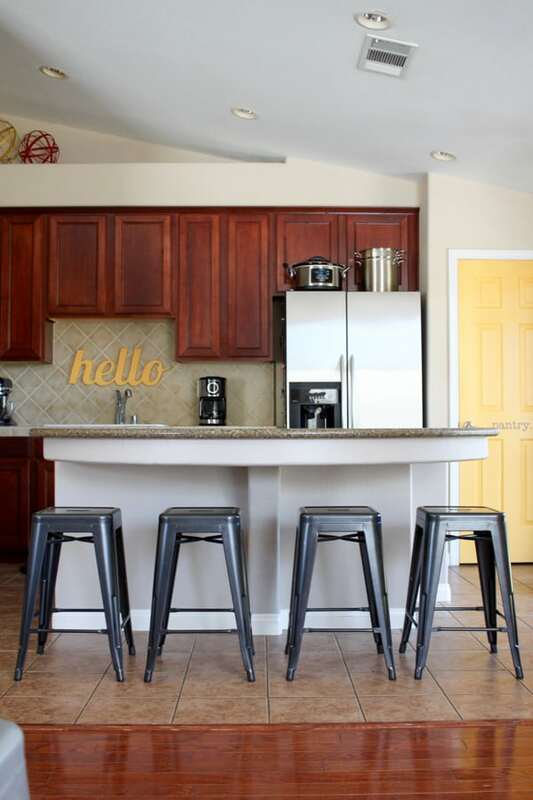 If you love red, I’m sure you would love it in your kitchen! Your kitchen instantly became my favourite, Melissa! I love every detail of it. And can I say the pantry glass door is perfect! 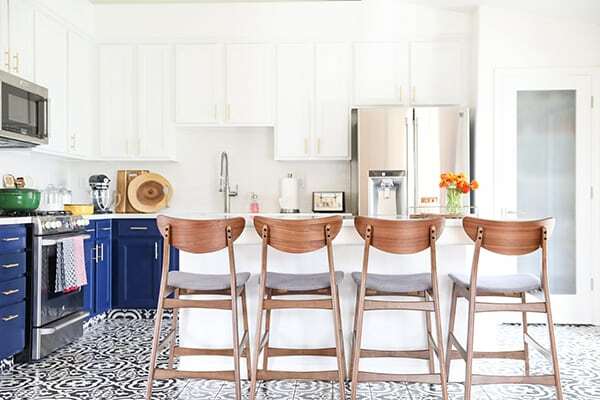 The stools, the floor and the colour of the cabinets, it’s a gorgeous kitchen! Thanks so much for your kind words, Jessica! I am wondering if you removed your cabinets before replacing the tile? We just bought a house that has really great cabinets but terrible tile flooring. I don’t want to remove the cabinets but am wondering how to get rid of the old tile and then install new tile? Thanks! i absolutely love the blue and white. Gorgeous! When this house was built, the cabinets were installed, then the tile. So we didn’t have to move the cabinets at all. They took out the old tile, then placed the new tile. Hope that helps!